This breed puts the “r” in round: round face, round eyes, round ears, round torso and round paws. 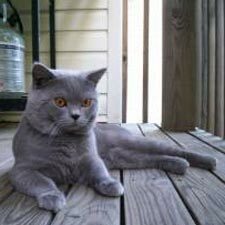 The British Shorthair is noted for its signature blue-colored coat that is dense and plush – designed to weather cold climates. However, cat registries now accept the British Shorthair in nearly 40 colors and patterns. The body comes in medium to large frames. The necks are thick and the chests are broad. Its velvety coat is reported to sport more fur per square inch than any other cat breed. Females weigh between 6 and 8 pounds and males average between 10 and 12 pounds. British Shorthairs rarely have met a lap that they didn’t like. Be aware that their thick coats make them like feline furnaces and your lap may become toasty warm. This breed is noted for its intelligence, loyalty and extending affection in a dignified manner. They won’t wow you by their speed, but they will win you over with their comical nature. Its coat needs minimal care – just run a comb through once or twice a week to maintain its mat-free condition. Enjoys the company of other household pets, but may opt to keep out of reach from overly energetic children. Be patient. This breed takes up to five years to attain full physical maturity. Due to its trusting, sweet nature, this is a breed that is best suited for indoor living. Always supervise your British Shorthair when outdoors. This British-born breed’s origins remain a bit ambiguous. It is believed that they were commonly viewed in the British countryside since the mid-1800s. The Cheshire Cat with its teasing grin made famous in Lewis Carroll’s classic, Alice in Wonderland, was said to have captured its look from this breed. A 14-year-old British Shorthair won Best in Show at the first formal cat show in 1871 at the Crystal Palace in London. This breed earned acceptance by both the Cat Fanciers Association and the International Cat Association. Ranked 14th in popularity among the CFA-recognized breeds, the British Shorthair gained championship status in 1980.